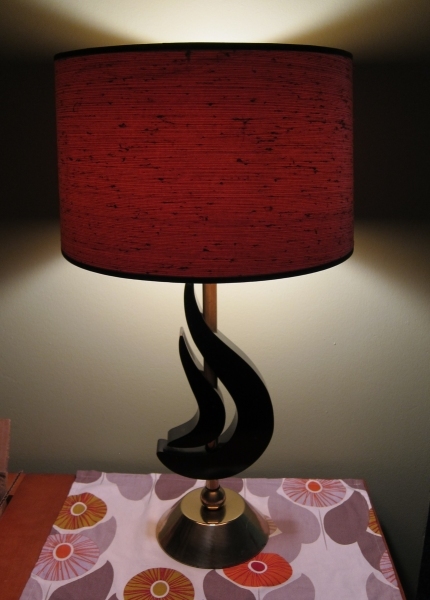 I’m all up in the mid-century modern decor lately, and I’ve been on the look-out for amazing lamps, ideally in great condition. This baby jumped out at me during a visit to Mrs. Huizenga (28 Roncesvalles Avenue) recently and I decided on the spot that it had to come home with me. At a reasonable $45, I overlooked the few small scratches in the swirly black wood part and touched them up easily with a marker when I got it home. For some reason I’d never been into Mrs. Huizenga on Roncy before, but after this visit, it will be a regular destination on my “looking for awesome things” list. Everything is very nicely curated and arranged, prices are very reasonable, and staff were very accommodating (we had seen the lamp early in the day on our way to te Roncesvalles Polish Festival and returned at near-closing to grab it). It’s a full gamut vintage store with not just furniture and housewares but clothes and accessories as well.